This page contains information about the Mayor, including fund-raising events and the charities supported. 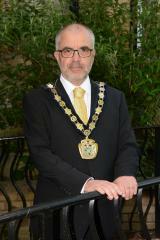 The Mayor of Oadby and Wigston, Councillor David Carter. Councillor David Carter was elected to the position of Mayor on 15th May 2018. Councillor David Carter has lived in Oadby for over 35 years and has been a Councillor for Oadby St Peter’s ward for the last 7 years. He is married to Janet and they have three adult children. His interests include conservation volunteering, walking and bird watching. After a career in Further Education, David has been involved in a number of community initiatives since 2010, including Pride of the Borough, Oadby Remembers 1914-1918 and Oadby Community Stakeholders, and during his mayoral year will continue to play an active role in the Borough. Delivery of support services to help improve the lives of people living with dementia. Cllr Carter said, "I am honoured to be elected as first citizen of the Borough and look forward to a busy year representing Oadby and Wigston - celebrating the work of local organisations and voluntary groups, in addition to meeting as many residents as possible”.